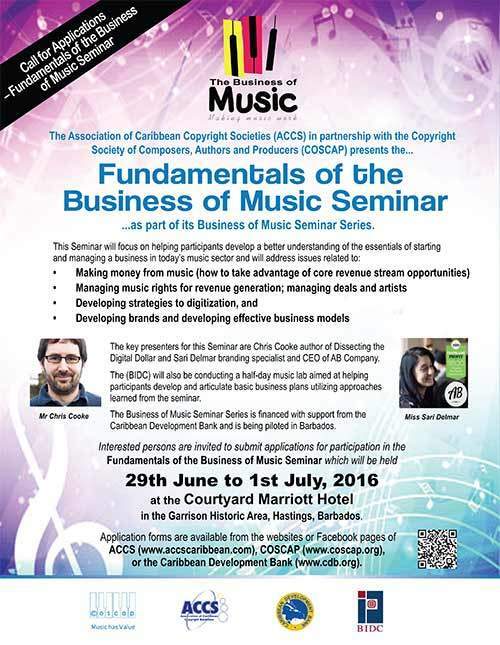 The Association of Caribbean Copyright Societies (ACCS) in partnership with Barbados-based Copyright Society of Composers, Authors and Publishes Incorporated (COSCAP) present the Fundamentals of the Business of Music Seminar. The Seminar, which will initially be piloted in Barbados, will run from Wednesday 29 June to Friday 1 July, at the Courtyard Marriot Hotel; and forms part of ACCS’ Business of Music Seminar Series — financed with support from the Caribbean Development Bank. Free online participation will be facilitated via live streaming on COSCAP’s website. The main objective of this music education seminar is to assist participants develop a better understanding of the essentials of starting and managing a business in today’s music sector. Key presenters for this 3–day event are Mr Chris Cooke, Author of “Dissecting the Digital Dollar” and Ms. Sari Delmar, Brand Specialist and CEO of AB Company. Meanwhile the Barbados Investment & Development Corporation (BIDC) will also conduct a half-day music lab, aimed at helping participants develop and articulate basic business plans utilizing approaches learned from the seminar. ECCO urges members and music professionals to take advantage of this significant music education seminar, to better equip themselves with the knowledge and tools to succeed in today’s music industry. The Association of Caribbean Copyrights Societies (ACCS) was founded in 2000, and serves as a Regional Centre, whose task it is to accurately monitor and maintain a centralized Caribbean database, ensuring acceptable data standards for all incoming and exported information on the works stored within this database. ACCS also acts as the communications “link” between the Caribbean copyright societies, facilitating regional integration and concentrated efforts in one common direction. ACCS can be viewed as the “umbrella” organisation which encompasses the author societies of the region, presenting one common voice on issues relating to Intellectual property and authors’ rights. Above all, the principal aim of Association of Caribbean Copyright Societies is to place regional authors, composers and publishers in a better position to collect royalties from international markets. The Founding members of ACCS are COSCAP (Copyright Society of Composers, Authors & Publishers Inc.) of Barbados, COTT (Copyright Music Organisation of Trinidad & Tobago), ECCO (Eastern Caribbean Collective Organisation for Music Rights) of the OECS, and JACAP (Jamaican Association of Composers, Authors & Publishers Ltd).